Located off the A975 just north of Cruden Bay and about 25 miles north of Aberdeen in northeast Scotland, the Bullers of Buchan is a collapsed sea cave forming an almost circular chasm (the “pot”) some 30 metres (100 feet) deep, where the ocean rushes in through a natural archway.The cliff scenery here is spectacular and seabirds of many species such as Puffins, Kittiwakes, Guillemots and Razorbills proliferate during the spring and summer, when wild flowers including campion, heather and orchids colour the cliff tops. 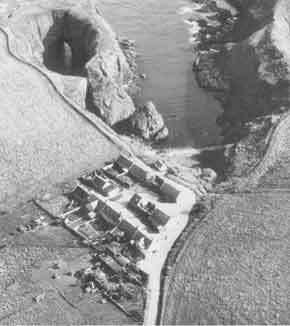 There is a car park from which a short road leads to a small group of cottages above the bay; a rough footpath leads northward in front of the cottages to the pot itself, some 100 metres along. For the energetic, the footpath continues along the coast through the Longhaven Wildlife Reserve towards Boddam. There is also a footpath leading south along the clifftop towards Slains Castle (another local attraction) and Cruden Bay. THE FOOTPATHS ARE ROUGH, UNFENCED AND AT TIMES VERY CLOSE TO THE CLIFF EDGE. GREAT CARE MUST BE TAKEN AT ALL TIMES AND CHILDREN MUST BE CLOSELY SUPERVISED. There are no tourist facilities at the Bullers; the nearest hotels, pubs and cafes may be found at Cruden Bay (which also boasts a very fine golf course). The nearest large town is Peterhead, 6 miles to the north. Click here to view a map of the location.